Summary: Hough was upset with his cousin's landlords, Bosler and Rubrake. When his cousin failed to pay rent, his landlords took his cousin's property. Along with his brother, Duane Lapp, Hough went to their residence in Fort Wayne "to get the property back." They were invited inside and once downstairs, Hough pulled a .45 automatic pistol. When Rubrake swung at him, Hough shot him in the chest. Bosler dropped to the floor and Hough shot him in the back. Hough then shot Rubrake again in the face. Hough took a TV remote and a beer which he thought may have fingerprints and left. Lapp testified at trial as the State's star witness. Trial:	Information/PC for Murder filed (04-10-86); Amended Information for DP filed (05-21-86); Voir Dire in Marion County (05-11-87); Jury Trial in Allen County (05-12-87, 05-13-87, 05-14-87); Verdict (05-14-87); DP Trial (05-15-87); Verdict (05-15-87); Court Sentencing (06-11-87). PCR denied, Summary Judgment to State granted on 08-09-94 by Special Judge Edward J. Meyers. Hough v. Indiana, 119 S.Ct. 550 (1998) (Cert. denied). Petition for Writ of Habeas Corpus filed on 08-11-98 in U.S. District Court, Northern District of Indiana. Hough v. Indiana, 123 S.Ct. 1927 (May 1, 2003) (Application for Stay denied). HOUGH WAS EXECUTED BY LETHAL INJECTION ON 05-02-03 12:25 AM EST. 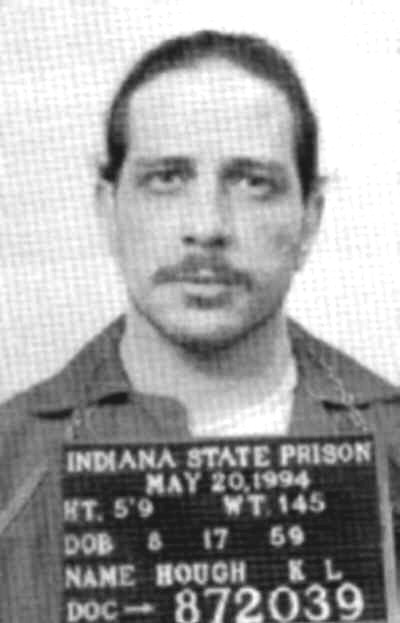 HE WAS THE 80TH CONVICTED MURDERER EXECUTED IN INDIANA SINCE 1900, AND THE 10TH SINCE THE DEATH PENALTY WAS REINSTATED IN 1977.